So if robust and reliable media audience data is available in African markets, why then is ROMI impossible to measure? Where is the disconnect coming in? At first glance one might be tempted to default to the time-honoured practice of “blaming the agency” for the impasse. 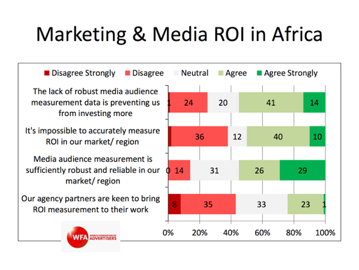 After all only 24% of marketers in Africa believe that their agency partners are “keen to bring ROMI measurements to their work” but that too is symptomatic, rather than causative. The real problem lies in what many marketers and media agencies, who are not familiar with the dynamics of advertising in Africa, believe constitutes robust audience measurement. Global advertisers have become progressively reliant on quantitative data analysis that reaches its predictable zenith in big data and programmatic planning. Media research has been increasingly aligned to delivering on procurement KPI rather than on proving in-market media channel efficacy. Unfortunately if advertisers emphasise discounts and measurable ‘savings” on measured media exposure then that will mitigate against the media agency taking responsibility for real in-market ROMI. If the media audience can’t be reported in GRP’s and CPP’s then how can the agency prove that it’s delivering on the buying KPI? Of course, through the primary AMPS database and the (Radio Audience Measurement Survey) RAMS diaries and (TV Audience Measurement Survey) TAMS Peoplemeters, advertisers in South Africa have come to believe that this level of access to data and scrutiny represents the minimum level of effective reporting and view the absence of such detailed data in Africa to be a barrier to entry. But the absence of an algorithm or access to programmatic planning should not imply the absence of logic and measurable ROMI. Where readership, listenership and viewership data doesn’t exist in the same manner as it does in national surveys around the world, old technology and boots on the ground can still provide valuable audience insights. You don’t need sophisticated GPS tracking data to determine the best position for OOH signage covering traffic to and from Jomo Kenyatta International Airport. What you need is for someone to actually inspect the Mombasa Road to make sure that the marabou storks haven’t built a communal nest in front of your billboard. That’s also effective media planning in Africa. Simple geo-segmentation and small scale studies using diaries or even anthropological snapshots will provide significant insights into media usage patterns. These learnings can then be overlaid onto similar geo-communities and most importantly against sales. In terms of African consumers we need to first find out what media actually works (real ROMI) and then put in place the means to measure the scale of the exposure so that we can compute the less significant media savings. The WFA report critically highlights the need to create a deeper understanding of consumers, and the right insight into what drives purchasing behaviour as a fundamental pillar of winning brands in Africa. Real insights rather than general assumptions. That implies investing in local and relevant creative messaging and in many instances, surprisingly, the need to stop driving short term promotions and price off discounting. 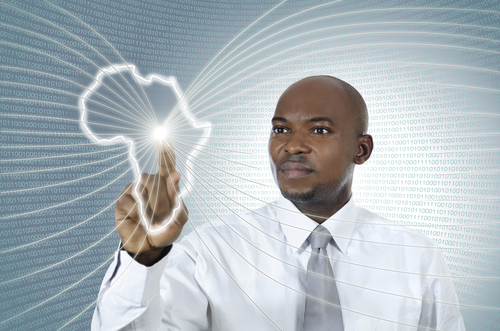 Winning agencies in Africa will be agencies with the most insightful and usable consumer insights. Some things don’t change over time.